Double window law enforcement identification case with outside badge flap. 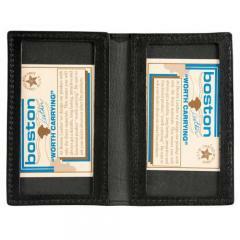 This law enforcement badge and ID case is constructed of genuine leather and is of the very best quality. Made in the USA. They are exactly what I wanted. I'm very satisfied.